and fluid/melt inclusions to isotopic measurements of C, O, Mg, Si, S, Ca, Ti and Fe in both terrestrial, meteoritic, and extra-solar materials. 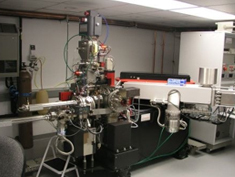 In addition, a high-transmission, large radius, multi-collector secondary beamline for the 6f is being developed that will have capabilities (high transmission at high resolution) similar to or better than the Cameca 1270 ion microprobe when completed. 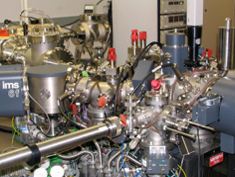 (Pictured left to right): The Cameca IMS 6F viewed from the source end. Samples are inserted with the long tube at the left. Beyond the IMS 6F label is the 1-meter extended geometry sector; The 1-meter extended geometry sector is under development at DTM. 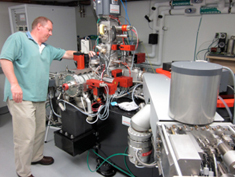 This will allow for a high-resolution, high-transmission simultaneous analyses of stable isotopes of H, C, N, O, and S; The Cameca NanoSIMS 50L; The Cameca NanoSIMS 50L with staff scientist Eric Hauri adjusting an aperature on the primary beam column. In the NanoSIMS, the ion source starts verticle and turns coaxial to the secondary ion beam path. 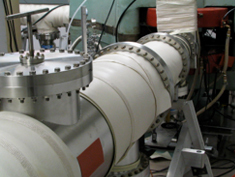 The magnet is of high dispersion Mattauch-Herzog design allowing simultaneous collection of up to 7 isotopes.